Roberto Mancini warned his Manchester City players not to rest on their laurels after their win over Manchester United in the FA Cup semi-final. A second-half goal from Yaya Toure proved enough to secure City a place in their first FA Cup final in 30 years. "We must not forget we play another game. Today we won only the semi-final," said the City manager. City face either Stoke or Bolton who face each other in the second semi-final at Wembley on Sunday. United twice came close to scoring through Dimitar Berbatov early in the match, but then struggled to create anything other than a Nani free-kick that was pushed on to the bar by goalkeeper Joe Hart. Late in the game United were reduced to 10 men when veteran midfielder Paul Scholes was sent off for a rash tackle on Pablo Zabaleta, something United boss Sir Alex Ferguson described as one of Scholes's "red mist moments". Despite having an extra player for the last 20 minutes, Mancini said that his side showed maturity to hold on for the win. "It's difficult to play against United. They're used to playing this type of game every year. For us, it was the first time after a long time," said Mancini. "Maybe we had some fear in the first 20-25 minutes. In the last 10, 15 minutes of the first half, we started to play high, we started to press. "In the second half, we dominated the game. I am happy because we had fantastic spirit and we beat a team like United." But City's post-match celebrations were marred by an unsavoury incident on the full-time whistle involving temperamental striker Mario Balotelli. The Italian held out his shirt to celebrate in front of the United fans and Anderson and Rio Ferdinand responded by chasing after him to remonstrate. Heated exchanges with both United players followed and Balotelli, who further incensed Ferdinand by winking at the England defender, was dragged away from the incident by City's coaching staff. Mancini, who said he didn't see the incident because he was busy celebrating, said he wanted to wait before commenting further. "I didn't see it. 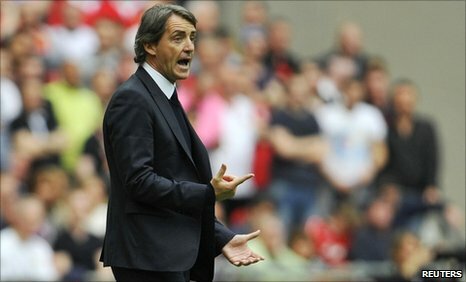 I want to wait because every time, 'It's Balotelli's fault'," said Mancini. When the incident was described to him, Mancini joked: "We can put him in jail? Next week, we can put him in jail for this."